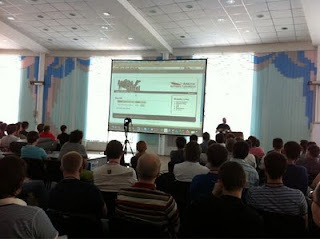 I had the pleasure of being invited to JEEConf in Kiev, Ukraine to give a talk about Apache Camel. The planning was a bit tight, as I had to be in Washington 2 days later for the CamelOne conference. But we managed to find a compromise, so I had a stop over in between, so I could get back to my family and sleep for one night before being on the road again. The JEEConf is a newly organized conference, hosted by XP Injection. I must say they have done an excellent job. They sure made me fell very welcome and had everything planned. So they had me picked up at the airport to bring me to my hotel. Usually I have to find my own way when I give talks. Nice to have may name on a sign, when I arrive at the airport. The hotel was Hotel Rus. Its was a state of the art Hotel when it was build about 20 years ago. And its still a very nice and clean hotel. It was located in downtown Kiev. My fellow colleague Dejan Bosnanak was also speaking (about ActiveMQ) and he was also stating at Rus. He had a room view a view in the opposite direction than me. From his room he could see the construction workers very busy working on the new football stadium they are building for the European Championship next year. He said they have to hurry up as there was only a skeleton frame currently. The city of Kiev is divided into two by a major river. The next morning a driver picked up Dejan and I from Hotel Rus, and drove us across town. The event took place at an Exhibition hall. About 200 people or thereabout showed up, if I had to guess. At the exhibition hall there was several booth sponsors. I had the honor of the first talk of the day (there was 3 parallel tracks). And I guess about half of the attendees showed up. I gave the talk, which I think vent very well. The live demo just worked. And there was good talks at the end. Dejan's talk was late in the afternoon, so we had plenty of time to talk to the booth vendors, listen to other talks etc. However as most talks was in Russia, it was hard to follow and understand. So Dejan and I decided to go for a walk and checkout the neighborhood. Down the road we found a coffee house, where we had .. yes coffee and cake. As neither of us had local currency, it was a challenge to pay. As they did not accept credit cards. In the end we solved this by paying using euro bills. Thank you Dejan for buying and paying for the coffee. After Dejans talk we both felt a bit tired, so we went back to our hotel for a little power nap. Then at 8pm we meetup with the organizers and some of the other speaks for a dinner and drinks. The venue was a cellar restaurant which had a USSR and the 80 ties music theme. So it was a bit surreal. The food and beers was great. And I had a great time talking to some of the speakers. I am sure this conference will go from strength to strength. The organizers did a fantastic job. The only negative was that the conference day was very long. It ended at about 8pm. But I guess that could be a culture thing. Maybe next year the conference is spanning two days and they will be able to end the 1st day earlier. The slides from the conference is available at slideshare. After the conference Aleksey told me the attendees liked my talk and from initial feedback I was one of the best speakers. I am really glad they liked it in Kyiv as well. Oh and they video taped all the talks, and they will be available later. I wish to thank Anna, Nicholas, and Aleksey for a great conference and inviting me to come. Hope to see you next year. Over the course of time, we have added many unit tests and components to Apache Camel. So as of today we have more than 7300 unit tests and 100+ artifacts to test. 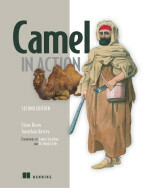 As a consequence doing a full test on the Camel source code would therefore take time. On a standard developer laptop, it could take 3 hours or more to run all the tests. Of course we have an arsenal of CI servers that run full tests overnight at Apache, and also FuseSource. So there are plenty of opportunities to check tests results. But nevertheless it would be better if testing was faster, so when we do development on the Camel source code, we can more quickly run unit tests to ensure the changes dont break stuff. So in recent time I have looked into improving this. I managed to optimize the Camel core so it boot up faster. For example the core will now hard-load the necessary core type converters, instead of doing a classpath scanning. Likewise we have changed the Camel test kit, to by default lazy load additional type converters on-demand. That cut down the need for doing a classpath scan for those additional type converters. This change alone is a great improvement when you have a lot of unit tests, as it all adds up. There were some other improvements here and there that all helped as well. For example cutting down on the needed dependencies using when testing components. So all together we have made the testing roughly 20% faster. That is a good improvement. For example we cut down 34m on testing time on the Apache CI servers. These changes will make it into the next Apache Camel 2.8 release.